Wednesday night shows are hard to pull off. It's hump day. The week barely started and it's barely over. I gotta work in the morning. But here I am, writing a show review of one of those Wednesday night "messes." Lindberg's in Springfield, Mo., is the best venue in town as far as sound and atmosphere. The sound system was put together by a real musician and the decor was designed by true music fan. Each show is looked over by beautiful portraits of patron saints Elvis, Hank Williams, Johnny Cash, Robert Johnson, Bob Dylan, and Tom Waits. On this nondescript Wednesday evening, Red Collar was to perform at Lindberg's. It was a fill in show. They weren't even supposed to be there, but fate brought them to the edge of the middle of nowhere. Mark Bilyeu of popular local band Big Smith opened the night with a talented and entertaining set. My friend Brett and I came in during the beginning of Bilyeu's set. He entertained the sparse crowd with bluegrass, old rhythm & blues, and alt country songs. I listened casually as I watched the Cardinals game, which was just getting started in L.A. The Cards got out to a 2 run lead and Adam Wainwright looked unhittable until the 7th inning. By that time, Bilyeu finished his set. A DJ was spinning his rockabilly and old r&b records by that time. The bartender very briefly changed the TV to the Weather Channel. It said we were in a thunderstorm warning and tornado watch. My buddy and I looked at each other and kind of gave each other the same quizzical look. Then we looked to the monsoon outside. Sideways rain and not infrequent lightning danced outside. We hadn't noticed before, but now we thought about trekking to our cars in this piss poor weather. As we looked away from the meteorological commotion outside, Wainwright gave up a solo homer. The game ended up tied by the end of the 7th. Red Collar humbly took the stage. They sound checked and knocked into their first song. Now, you'll have to forgive me because I just very recently started listening to this band so I can't really give you proper song titles, but rest assured: this band brought it. As sheets of rain relentlessly beat against the windows at Lindberg's, Red Collar brought equal intensity. Jason Kutchma led the way as if he was conducting a hurricane. Guitarist Mike Jackson never stopped his kinetic rhythm. Beth Kutchma kept some tight beats on bass and drummer Jon Truesdale is as talented a drummer as you'll find. 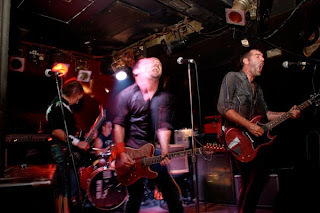 The band's songs pierced each listener at the venue. Driving rain, relentless beats, and flashes of lightning and greatness illuminated. During the song "Pilgrim" I saw through a window a streak of lightning strike across the empty sky. It was a goosebumps moment. The room was moving. Here's the kicker: there were six (myself included) standing close to the stage and about eight people sitting at the bar or working the sound. With such an anemic turnout, the band could have given a quick, minimal performance. But they played the house as if it was packed to the gills. After the initial set, local talented musician Jeb started the "One more song" chant. Jason asked, "One more song? How about we do two?" All six to eight of us erupted. Jason explained that he was trying out some solo work. He performed Tom Waits' "Better Off Without A Wife," with altered lyrics that were meant as a tribute to his wife Beth. The band closed with "Used Guitars" (I think) (Confirmed!). During the set, the rain slowly died down. I looked back to the Cards game. Ryan Franklin just saved his 31st game of the season in a 3-2 game. Jon and Jason both promised that the band would come back in September. Here's what you need to do. Contact the band and demand that they tour within 200 miles of your town. I know how it is when you live near podunk. You only travel far when it is a band you know and you trust will be worth the gas. As someone in your shoes, you'll have to trust me: if this band tours near you, go see them. It was recently announced that Topps would be the "exclusive" trading card producer for Major League Baseball. This pretty effectively eliminates all competition from the baseball card industry. 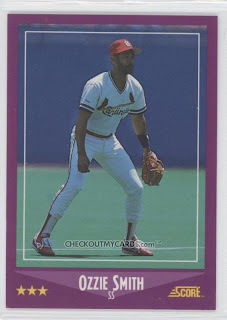 Good bye, Fleer. Good bye, Bowman. Good bye, Score. Probably good bye, Upper Deck. It was reported recently that Upper Deck has a deal with the MLB Players Association. They say they'll continue to produce cards in 2010. It'll be odd, but I can see some lame cards with players in front of a black background wearing non-descript t-shirts that vaguely happen to be the same color of their team. Topps head honcho Michael Eisner (yes, that Michael Eisner) says he is doing it to not confuse kids or some such crap. Let's call a spade a spade here. It's an exclusivity deal that eliminates competition and creates a monopoly on the market. Before this mess was announced, I had been looking around a local flea market. I found big box that looked to be a complete set of cards from the late 80s/early 90s. I know it's a cliche, but remember when that would have been worth a sheik's ransom? I began collecting when I was 9 or 10. I received a large number of cards from someone who was a big collector. They were all the same year and brand. Because that is the majority of my collection and was my first card, it became my brand. The 1988 Score card. 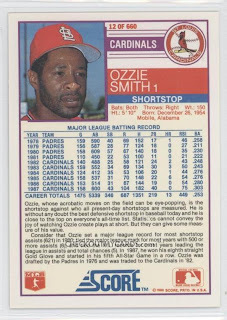 It wasn't flashy like Upper Decks or Topps cards, but they all had good in-game pictures and nice write-ups on the players on the back. Each pack also had a Magic Motion Trivia Card with some sort of fact that I would hurry up and forget. As with everything on planet Earth, there is a blog dedicated to completing a set of 1988 Score. A least a couple people are dedicated to the brand. I spent a few summers looking for new cards and organizing them by team in my baseball card binder. Unlike the cliche, I still have the binder, so when the baseball card market finally rebounds, I'll be ready. Suckers. Anyway, anytime there is news about baseball cards, it gets me a little nostalgic like most guys my age. But, like most things in life, we move on, we forget. The cards just seve as a bookmark in a long line of important "forgettable" life moments. I'll take a quick break from doing nothing and take a look at one of the consistent marvels of the game: the curveball. In the baseball blogosphere, there is a whole genre of stat centric sites that try to determine the value of players. Beyond simple boxscore, stat analyzers are another set of writers who examine the physics and effectiveness of specific pitches. Check out Fangraphs for a world of stats you have never even considered. Check out this article by Dave Allen at Fangraphs from earlier this year. 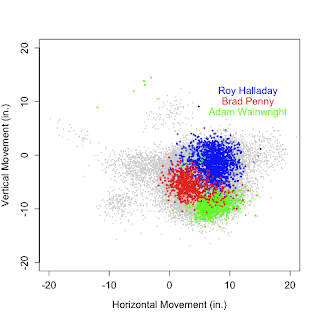 In it, he analyzes the vertical and horizontal motion of curveballs thrown by Adam Wainwright, Roy Halladay, and Brad Penny. Notice this chart. The 0 in the "Vertical Movement" axis represents how much the ball moves vertically from the release point to the plate. Incidentally, the horizontal axis represents how much a ball moves toward or away from a hitter. As you can see, Wainwright and Halladay have much more overall movement on their pitches than Penny, which is why an indicator of why their curveballs are more effective than Penny's. But also look at this visualization that I have just recently seen. It won an award for optical illusions. (Sorry, I can't seem to embed the visualization.) Follow the directions and notice how much the ball appears to curve away even though it is always moving in a straight line. Despite the cool optical surprise, I'm not sure what it tells us about curveballs in real life baseball. If this is supposed to somehow represent the deception of a curveball, then it is an aerial view of a curve with no horizontal movement. It doesn't give us an idea of what that motion looks like from a batter's point-of-view. The batter, catcher, and umpire (presumably) have their eye on the ball the whole time. Keeping your eye on the ball in the visualization keeps the sphere in its true path. But certainly, the spin on the ball plays some slight trick on the battery. If a pitch is moving up around eight inches from its release point and the spin creates an illusion of movement, it is a wonder that anyone can hit the pitch, let alone on a consistent basis. If you are interested in a much more informed analysis of pitches, check out Drew Fairservice's "Kicking and Screaming" recurring feature at Walkoff Walk. In completely unrelated news, if you ever have to explain the infield fly rule to anyone, just play this song by The Isotopes. The Isotopes four-song EP titled Heatseaker is being digitally distributed by Red Scare Industries. Each song has to do with baseball. Sounds so familiar. Curveball pitching data image courtesy of Dave Allen at Fangraphs.